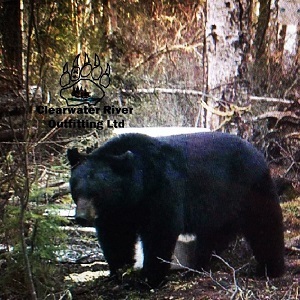 Northern Alberta Black Bears with the adventure of jet boating included. Very remote hunting grounds because of the jet boat access only. Stay in lodges with hot showers and wood stoves for heat at night. 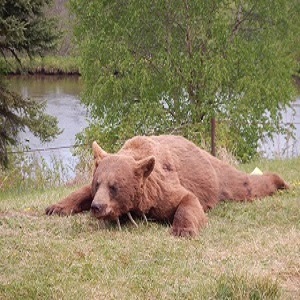 Also second bear is an option with a trophy fee of $1000.00. On top of all this we add a bonus license for the wolf no trophy fees applied. Last Minute price 3900+300 for license + gst. Hunt starts from Fort McMurray Alberta. We ask that you arrive the day before the hunt and catch a shuttle to Nomad inn. This is where we get great rates for the one night, then we meet that night to see if there’s anything needed around town before loading the boats the next morning at 7am. Ask about a better rates for group hunters. This is a rifle hunt or a bow hunt to which the hunter would prefer. 95% of our bears are Pope and Young bears and we’ve never sent Home a Hunter with out a Bear. 30% chance of color phase. Everything is included in price except alcohol and air fare and taxidermy.